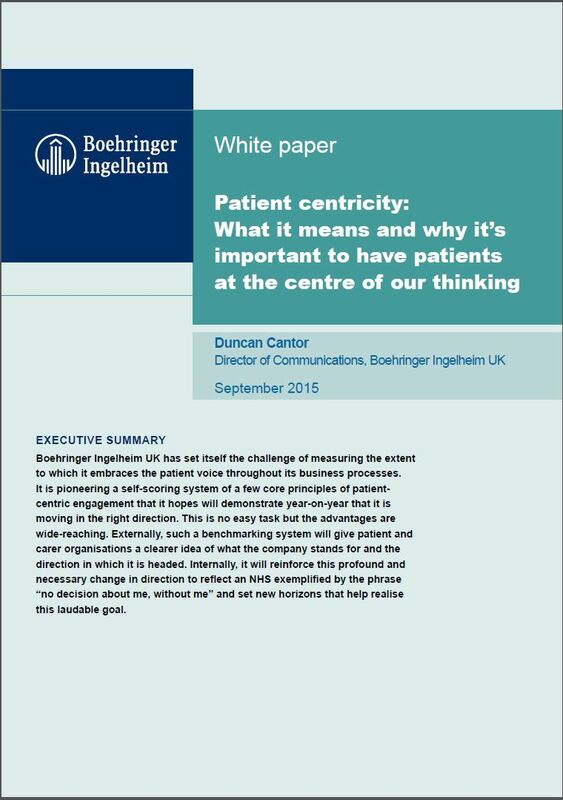 Boehringer Ingelheim UK has set itself the challenge of measuring the extent to which it embraces the patient voice throughout its business processes. It is pioneering a self-scoring system of a few core principles of patient- centric engagement that it hopes will demonstrate year-on-year that it is moving in the right direction. This is no easy task but the advantages are wide-reaching. Externally, such a benchmarking system will give patient and carer organisations a clearer idea of what the company stands for and the direction in which it is headed. Internally, it will reinforce this profound and necessary change in direction to reflect an NHS exemplified by the phrase “no decision about me, without me” and set new horizons that help realise this laudable goal. a third group of individuals play an absolutely pivotal role in this healthcare ecosystem and are frequently overlooked – the carers. There are well over 6 million carers in the United Kingdom, who provide essential support to the people they care for (and their families) with regards to their health, social needs and psychological wellbeing. Without carers fulfilling their important duties, all other stakeholders stand to lose out. The people they care for will lack the daily support that strained healthcare providers and social care systems struggle to provide, which can lead to unrecognised new comorbidities, failure to identify treatment side effects or non-adherence to treatment schedules. advice, facilitating their engagement with other healthcare stakeholders and directly providing services to support them, pharmaceutical companies can deliver beneficial outcomes for all sides – the industry, healthcare providers / payers, patients and, of course, the carers themselves. 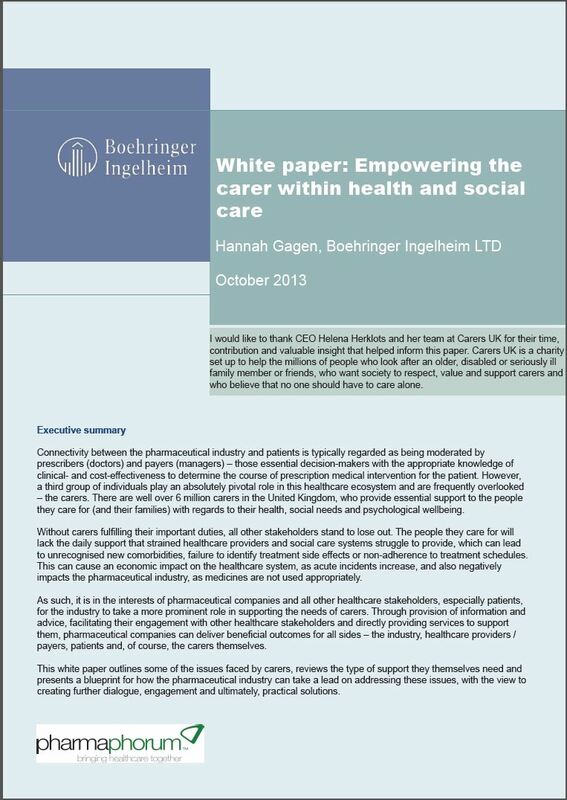 This white paper outlines some of the issues faced by carers, reviews the type of support they themselves need and presents a blueprint for how the pharmaceutical industry can take a lead on addressing these issues, with the view to creating further dialogue, engagement and ultimately, practical solutions. Studies have shown that patients across all therapeutic areas, geographies, nationalities, levels of social status and any other variable, fail to take their medicines as prescribed. What this growing body of research cannot reveal, however, is how they might be persuaded to change their behaviour. 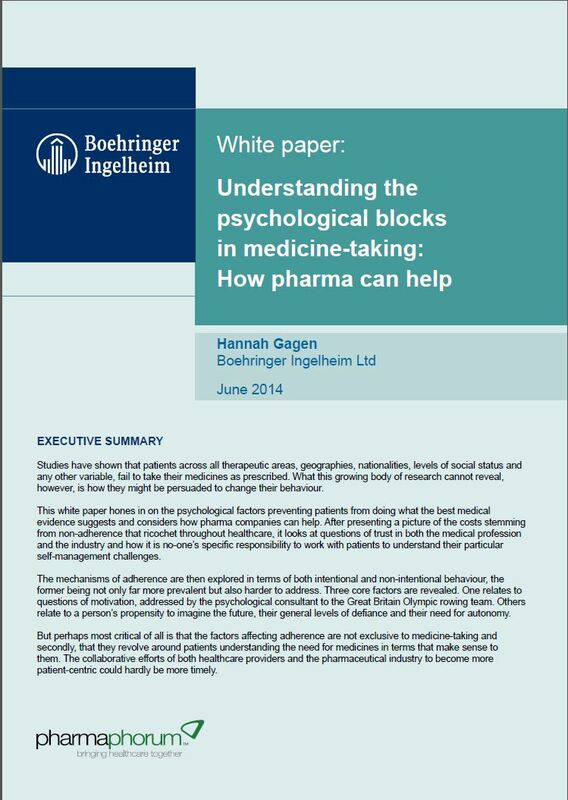 This white paper hones in on the psychological factors preventing patients from doing what the best medical evidence suggests and considers how pharma companies can help. After presenting a picture of the costs stemming from non-adherence that ricochet throughout healthcare, it looks at questions of trust in both the medical profession and the industry and how it is no-one’s specific responsibility to work with patients to understand their particular self‑management challenges. The mechanisms of adherence are then explored in terms of both intentional and non-intentional behaviour, the former being not only far more prevalent but also harder to address. Three core factors are revealed. One relates to questions of motivation, addressed by the psychological consultant to the Great Britain Olympic rowing team. Others relate to a person’s propensity to imagine the future, their general levels of defiance and their need for autonomy. But perhaps most critical of all is that the factors affecting adherence are not exclusive to medicine-taking and secondly, that they revolve around patients understanding the need for medicines in terms that make sense to them. The collaborative efforts of both healthcare providers and the pharmaceutical industry to become more patient‑centric could hardly be more timely.